Generally I’m a big advocate of landmarking – certain places just need special protection. But these days most of those places have been identified and now some of the places they’re trying to landmark don’t really warrant landmarking. Case and point is the Mount Morris Park Historic District – there are pluses and minuses to the proposed expansion. The core of Mount Morris Park was landmarked by the City in 1971 – just a few short years after landmarking began in New York. The neighborhood was then put on the National Register of Historic Places in 1973. Then in 1996 the boundaries defined by the National Register of Historic Places were extended (see map below). Now residents are talking about changing the City’s landmark boundaries to reflect the national boundaries. How is that something that should be landmarked? That’s not the streetscape of a historically significant area that needs landmarking. That’s just a nice street in Harlem. There are brownstones on the south side of the street, but I wouldn’t say they warrant landmarking either. 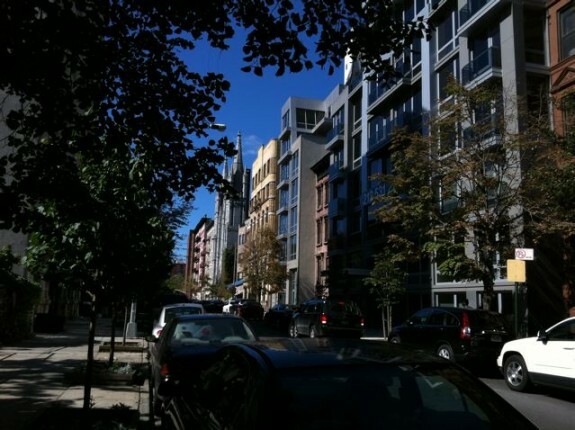 It’s not like every brownstone in Harlem needs to be landmarked. Those townhouses are incredible. They absolutely need to be landmarked, and everything adjacent to them that can be landmarked should be landmarked to preserve the general feel of the era when they were built (unfortunately, there’s a 1950s-era school across the street from them). But my point is, we’re not that special. The other night we were walking around lower Manhattan. What struck me was the layers of history you could see in the buildings. New and old were mixed together and there were new interpretations and adaptations of old buildings. I liked the mix of it all. As you can see in the pictures above, our block is a bit like that. 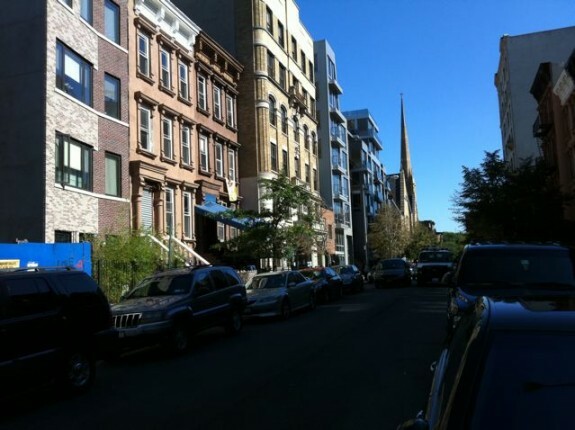 There are a few old brick townhouses with mansard roofs, there are classic brownstones in a few different styles, there are a couple churches on the block (both landmarked), and there are apartment buildings. One apartment building looks like it’s from the 1930s, others look like they’re more turn of the century. And then there’s the gleaming new condo – Windows on 123. We have that wonderful patchwork of different historical eras. Thing is, you don’t preserve a patchwork of eras by freezing it in time. You preserve it by letting the patchwork continue to evolve. For example, when new and old are co-existing so closely, why shouldn’t the old buildings have modern doors or windows? Yet that is what would be prevented if the block were landmarked. Yes, there is something special about our block, but the best way to preserve it is through zoning, not through landmarking. Many of the old apartment buildings on our block are built over their currently allowed F.A.R. (floor area ratio) which means if they were torn down you’d have to build a smaller building in their place. That’s a huge incentive for their owners to keep them in tact and renovate them. Even our townhouse – it’s currently at a FAR of 3.0. The max is 3.44, so you can’t even add another full floor to our building (though the previous owners did manage to fudge the numbers and get plans approved that included an additional floor). If it were no big deal to own a landmarked building we wouldn’t really care. But it’s a huge headache to own a landmarked building. So many things are more complicated and more expensive. And there are certain things you’re just not allowed to do. For example, we’ll be putting in large tilt-n-turn windows that would not be allowed if the building were landmarked. I’m sure our doors wouldn’t meet with landmarks approval either – they’re modern interpretations of old doors – still wood, and similarly proportioned to the original doors, but lacking the details you would find on an old door. If I lived on a block that warranted landmarking I’d gladly put up with the headaches associated with being landmarked. But our block doesn’t warrant landmarking so neither Dan nor I feel we should have to deal with the hassles of owning a landmarked building. There’s a community meeting this Tuesday evening (October 5th) at 7pm at the Rice High School library (74 West 124th Street). I plan on being there to see what the chances are of dropping 123rd Street from the proposed extension. 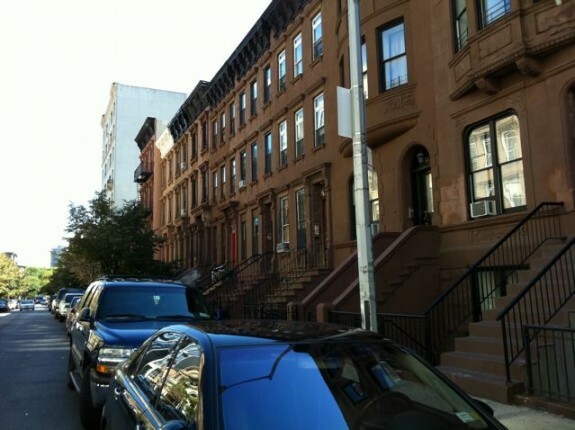 This entry was posted in Real Estate and tagged Brownstones (Brownstone Townhouses), Harlem Townhouses, West 123rd Street Harlem Brownstone by Jay. Bookmark the permalink. I totally agree with everything said! I should mention that since I wrote the blog post I’ve changed my mind a bit. I’d like to see the south side of our block landmarked. 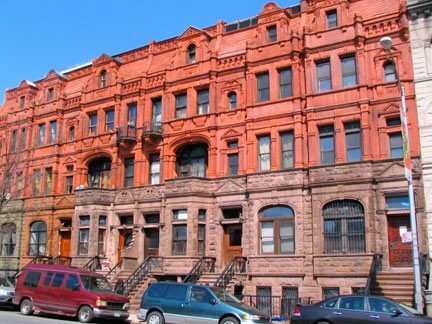 There are 16 brownstones in a row and it would be nice to have them preserved close to how they were originally and “encourage” our neighbors to do renovations that bring things back to how they once were. 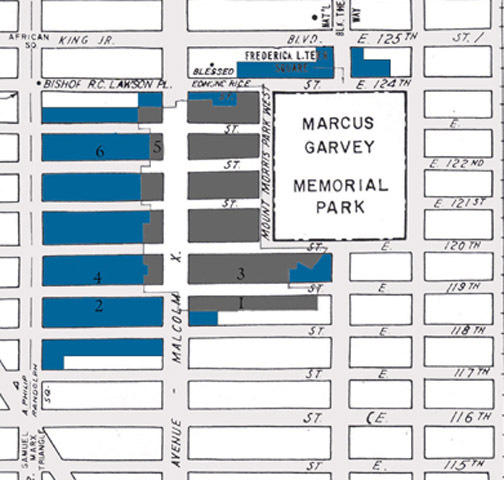 However, the north side of the block I still don’t think needs to be landmarked – it’s just too diverse.